In Forge War, players will take on the role of blacksmiths in a kingdom rife with marauding harpies, cursed dungeons and fire-breathing dragons. They are charged with gathering ore from the mines, purchasing weapon designs from the market and then using these resources to forge weapons for adventurers who will go on quests to fight back the ever-deepening darkness. If the adventurers are successful, they will return with more ore, money and other rewards with which players can invest back into their burgeoning weaponsmithing empire. 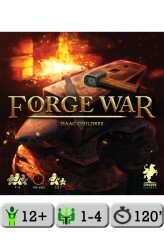 At its core, Forge War is a rewarding game of aggressive investment, which occurs through the acquisition of quests. Quest management becomes challenging for the player, however, because quests undertaken aren't completed immediately, but instead progres.. 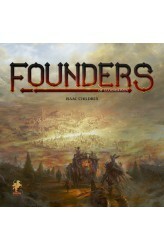 Founders of Gloomhaven is a competitive tile-placement, action-selection, city-building game in which each player controls a fantastical race working to build the city of Gloomhaven and gain influence over its residents. This is a standalone game set in the same universe as Gloomhaven. The events, however, take place hundreds of years before Gloomhaven and depict the original construction of the city. In Founders of Gloomhaven, players use action cards to place resource buildings on the map of the city, use these resources to create more advanced resources, then deliver them to proposed building sites to earn prestige. An individual player, however, cannot do everything on their own because they can import only a small number of resource types, depending on their race. 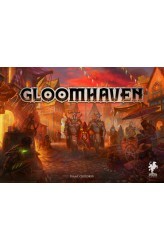 To..
Gloomhaven is a game of Euro-inspired tactical combat in a persistent world of shifting motives. Players will take on the role of a wandering adventurer with their own special set of skills and their own reasons for travelling to this dark corner of the world. Players must work together out of necessity to clear out menacing dungeons and forgotten ruins. In the process they will enhance their abilities with experience and loot, discover new locations to explore and plunder, and expand an ever-branching story fueled by the decisions they make. This is a game with a persistent and changing world that is ideally played over many game sessions. 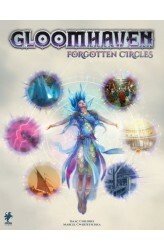 After a scenario, players will make decisions on what to do, which will determine how the story continues, kind of like a “Choose Your Own ..
Update 7/01/2019 - release uitgesteld naar maart 2019 Gloomhaven: Forgotten Circles, the first expansion for Gloomhaven, features twenty new scenarios that take place after the events of the original Gloomhaven campaign and involve one new character class — the Aesther Diviner — and her attempts to prevent an approaching calamity. The accompanying scenario book breaks these scenarios up across multiple pages to create more dynamic and surprising encounters. The expansion also features seven new monster types (including three new bosses) and fourteen new item ..